le dimensioni potrebbero cambiare senza preavviso - dimension can be change ! 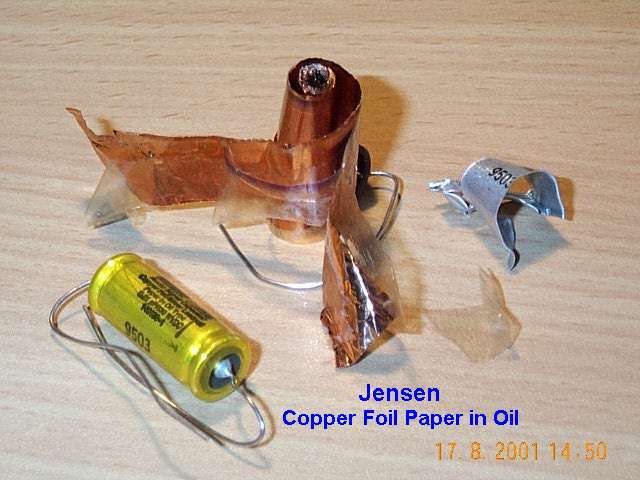 Paper in oil signal capacitors manufactured by Jensen. 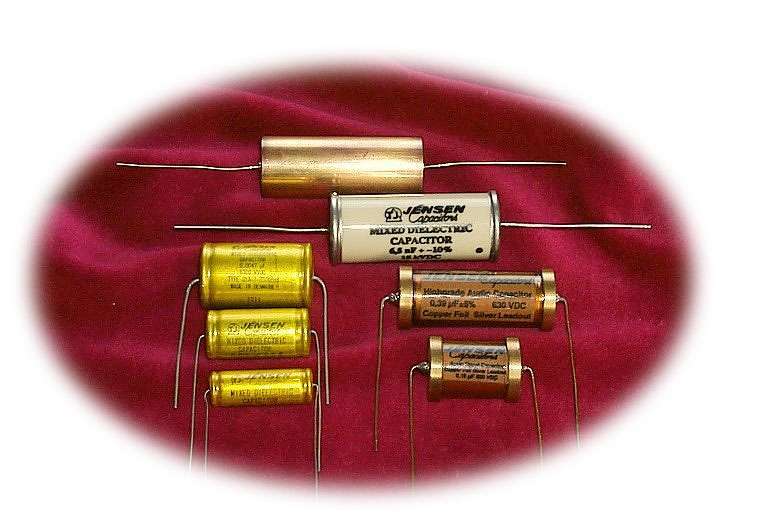 These capacitors have gained notoriety in the audio circles by Audio Note. These are the same capacitors without the AN brand and are famous for their sonic benefits. The fully handmade capacitors are manufactured with aluminum foil or copper foil electrodes and high density paper tissue, impregnated in biodegradable mineral oil. The winding, wound with fully controlled and high winding tension, is dried under high vacuum before impregnation. The winding is then hermetically sealed by means of two phenolic paper/synthetic rubber discs in an aluminum tube and terminated with pure silver wire. 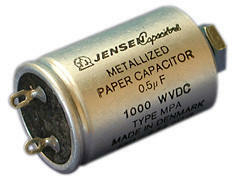 Jensen’s paper in oil caps are mainly used in tube amplifiers and preamplifiers or as fast by-pass caps because of their relatively low C/V value and voltage stability, but these capacitors are also used in high-end CD players and solid state amplifiers. Also in crossover networks many audiophiles are choosing the Jensen caps in the range from 1.5uf to 10uf because they provide very clear high frequencies. or silver foil for the signal path of high end audio equipment. High quality mineral oil impregnated paper capacitors with metal foil. Electrodes: Aluminium (as standard) tin, copper or silver foil, extended foil construction. Construction: Axial performance, hermetically sealed in aluminium tube (copper, brass or porcelain encasing is also available on request). The terminal leads - available in tinned copper or pure silver - &SHY; are solder-sealed to eyelets in the end-discs. The capacitor element is insulated from the tube. The terminal which is contacted the outer foil (the foil which is the closest to the can) is always marked with an vertical line on the marking. The capacitors are supplied with an insulation sleeve, but in applications where the sleeve distorts the sound we can deliver capacitors without sleeve. 10% tolerance and special tolerances are available on request. Max. ripple voltage: The sum of the peak ripple voltage and the applied DC voltage should not exceed the DC rating of the capacitor. Test voltage: 3 x Un between terminals and between terminals and container. Lifetime test: 250 hours at the maximum category temperature and 2 x Un, according to IEC 80 § 21. 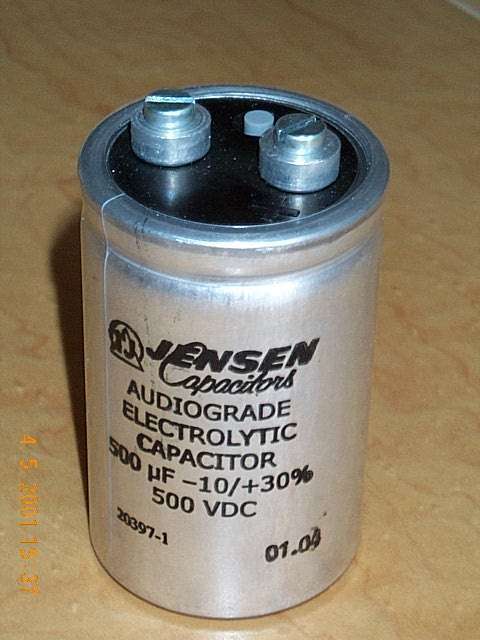 Jensen's AudioGrade electrolytic capacitors are made for the audiophiles who don't want to compromise the electrolytic capacitor quality either. Our philosophy is ultimate performance and as a consequence of manufacturing high quality capacitors for the primary signal path we have also developed a range of electrolytic capacitors mainly for use in power supply of solid state and tube high end audio equipment. 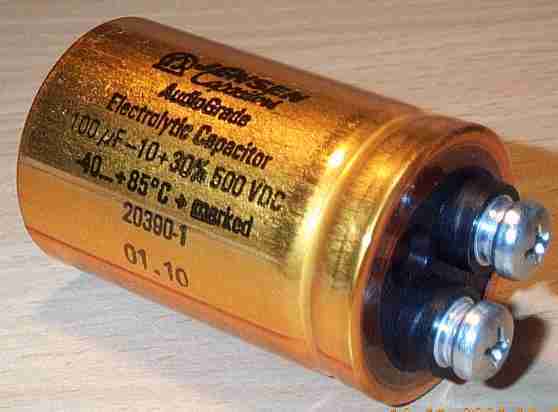 The AudioGrade electrolytic capacitors have been developed and manufactured with special attention to their effect on the sound. Combining our more than 35 years experience with intensive listening tests a lot of improvements have been achieved compared to the traditional long life electrolytics: Extra fine fiber mixture paper tissue, special electrolyte liquid, low etched anode and cathode foil with unique pore structure, ultra compact construction to minimize microphony. Construction : High voltage, polarised aluminium electrolytic capacitor encased in a cylindrical aluminium case. The capacitor is designed for central mounting M18 X 1,5. Connection by means of solder tags. Negative pole on the can. M18 nuts for fastening are standard, while insulation and contact ring with solder tag for the negative pole are optional. Application: Filtering and smoothing and energy storage in the power supply of high end vacuum tube and guitar amplifiers. Leakage current: 0,4 x C [µF] in mA at 20°C and rated voltage after 5 min. Operational leakage current is less than 20% of the above after 1 h or longer. Construction : High voltage, high capacitance, polarised aluminium electrolytic capacitor encased in cylindrical aluminium case. The capacitors are fully insulated and furnished with pressure relief and M5 screw terminals. Application: High energy discharge. Filtering and smoothing in the power supply of high end vacuum tube amplifiers. for crossover network filters for the finest loudspeakers. High quality mineral oil impregnated paper capacitors with aluminium foil electrodes, axial performance for crossover filters in loudspeaker systems. Construction: Type MPA are metallized capacitors of high quality, impregnated under high vacuum. Hermetically sealed in aluminium tubes with axial tinned copper leads. If dielectric faults should develop due to conducting particles, or if a momentary surge of voltage should puncture the dielectric, self-healing property functions to clear and isolate the fault. The capacitor then continues to operate normally in the circuit without interruption. Radial performance in aluminium can are available on request.The capacitors are supplied with an insulation sleeve, but in applications where the sleeve distorts the sound, we can deliver without sleeve. 5% tolerance and special tolerances are available on request. Test voltages: Terminal to terminal and terminals to container 1.5 x Un. The reputation of the electrolytic capacitors is not flattering. They are accused to be the worst component causing distortions in any circuit of a highend audio network. It doesn't matter if the good old electrolytic capacitor is sitting as a quick power source in the power supply or as a coupling capacitor in the pre- or power amplifier or in the crossover filter of a speaker system, they just destroy the whole thing. They have a high dielectric absorption causing serious phase(frequency) delays. Signals going through electrolytics are slowed down and suffer severe harmonic distortion. They have high impedance and ESL value at higher frequencies and their resonance frequency is too low to be used in a wide band amplifier. Most of the accusations are true, but then everybody knows that the electrolytics are indispensable because of their unbeatable C/V ratio. It is necessary and possible to improve the worst drawbacks of the electrolytics. Many companies have made attempts in this direction. By using smooth or low etched foils to improve the frequency characteristic of the capacitor the yield capacitance and the C/V ratio is decreased. Bipolar electrolytics has become very popular nowadays. The ESR and the impedance at high frequencies can be improved by choosing special paper tissue and low viscosity, low resistance electrolyte solutions. The mechanical design and the construction of the capacitors play an important role as to how they are sounding. An tight wound, properly connected and well fixed winding in a good shielded case with suitable short terminals sometimes do miracles to the sound, usually immeasurable but very audible. Special solutions for decreasing the non-linear harmonic distortion and noise level at higher frequencies caused by ion transfer in electrolytics in comparison with electron transfer in the other components, are also known. (Black Gate, Cerafine etc.) Many have made efforts to improve one or more features of electrolytic capacitors with the intention that they would also sound better and thus be more applicable for high end audio systems. The problem is that most of the improvement efforts made have been concentrated on a range of measurable parameters and did not take the electrolytic capacitor as an audiosonic component into consideration. Companies producing and developing electrolytics look for measurable improvements to document their ability to meet the higher and higher or extraordinary requirements of the electronic industry and they don't care about the sonic features of the new product. Owing to more than 20 years experience in producing and developing electrolytic capacitors we have made a lot of efforts to make the electrolytics much better and suitable for high-end audio. We did not only carefully analyse the drawbacks and insufficiencies of electrolytic capacitors in high-end circuits but also we have participated in innumerable listening tests together with people building and developing amplifiers and loudspeakers. As a result of our year long activity in this field we can proudly say that our electrolytic capacitors represent the cutting edge quality today. What makes our capacitors better than the other electrolytics declared "audio signal" and "very high frequency" products? The answer is simple: we did not only take all the chemical and electrochemical factors, electrical and mechanical parameters and constructional features which could influence the sound quality into consideration. We have also investigated the total effect and the general sonic impression of the individual changes we had made during our development activities. This gives the audible plus. composition and forming voltage ......and many others.